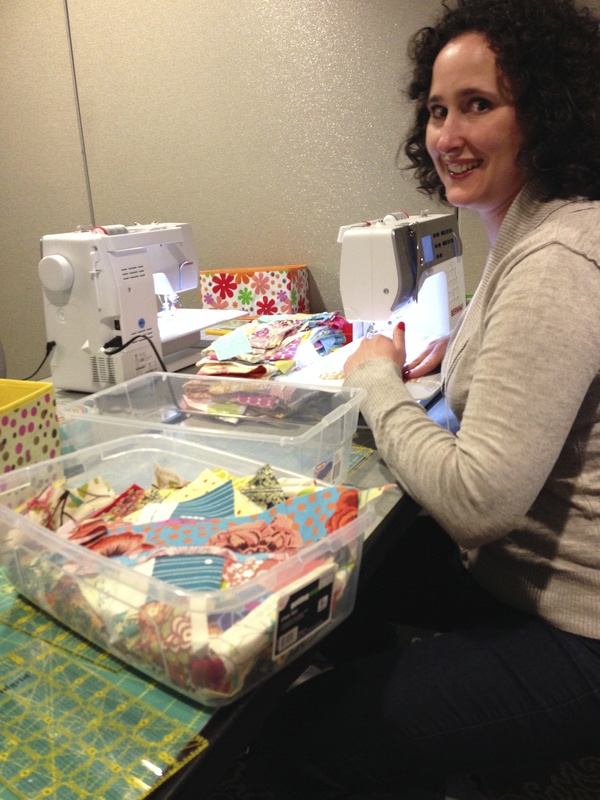 Check out the photos below from our September Sew Day! 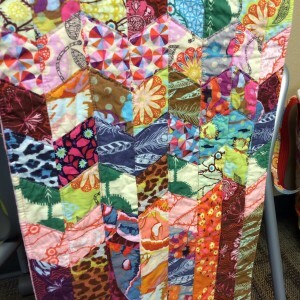 February 2015 Sew Day – Join Us! 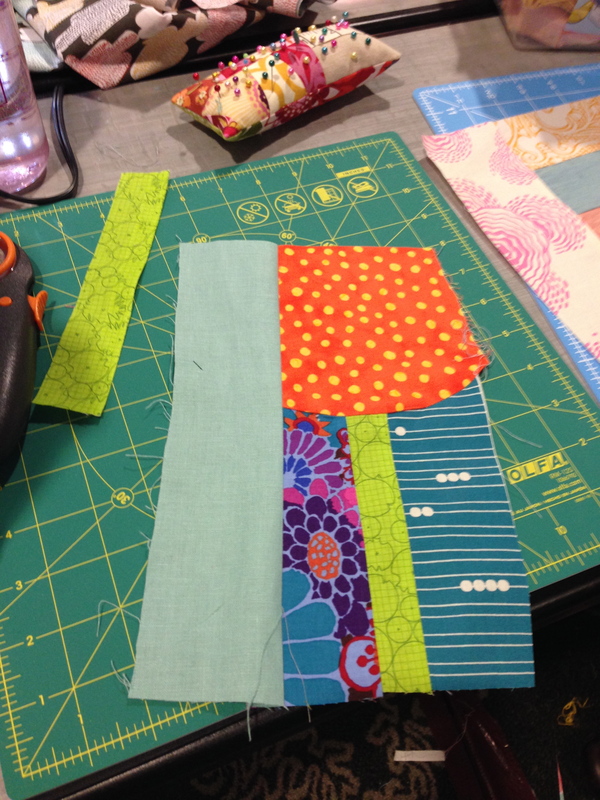 Join us for our monthly Sew Day! When: Saturday, February 28, 1 – 4 p.m.
We are in for an inspirational treat this Sew Day! Local mosaic artist Anna Webb will be joining us at the beginning of our meeting as our guest speaker. 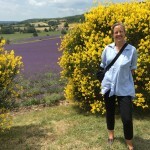 Some of you might be familiar with Anna as a reporter for the Idaho Statesman, but she is also a talented mosaic artist and will be speaking to us about the artistic intersection of mosaics and quilts. She has traveled the world to see and study mosaics and has created several beautiful mosaic art installations in Boise. She’ll be sharing photos from her travels, mosaic art that inspires her (lots of quilty inspiration, too!) and her thoughts on composition, color choice, and her creative process. This is one guild meeting not to miss! Did you attend QuiltCon? If we have time after Anna’s presentation we would love for you to share your experience with the group (if you don’t want to, that’s okay too). Also, don’t forget to bring your completed BOM and finished projects to share! As you can tell from the pictures we had a great time on Saturday at the Boise Modern Quilt Guild After-Christmas party. The apron swap was a big hit! We had eight women participate and had a lot of fun watching as each person saw their new apron for the first time. The amazing QuiltCon Charity Quilt that Laura Pukstas designed and quilted was showcased on Lori’s staircase during our party. 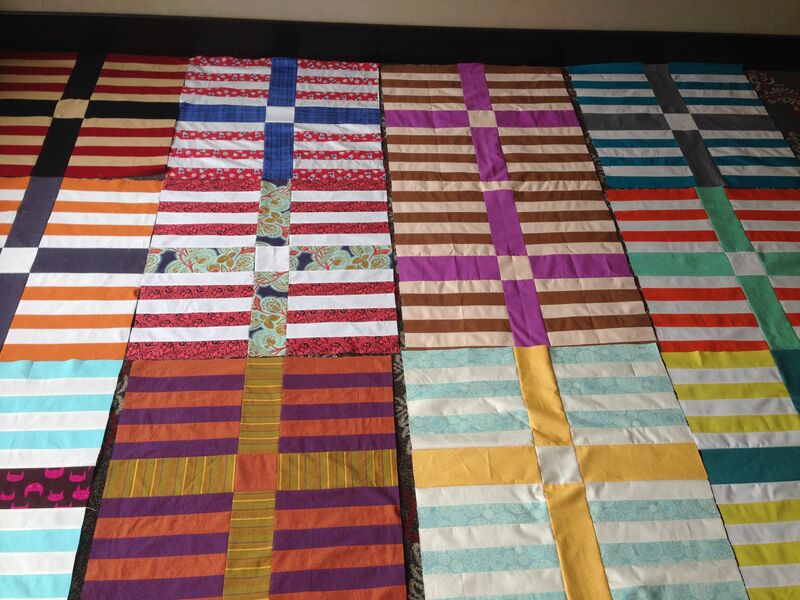 Many thanks to Marilyn Shake, Gwen Smith, Darla Christensen, and Angela Bowman for helping with piecing, binding and everything else that went into the quilt. It is now in route to the MQG and will be showcased in February at QuiltCon with other charity quilts. Several members also brought quilts and other items to share with the group. It’s always so fun to see how creative everyone is! December 2014 After-Christmas Party – Join Us! Mark your calendars! 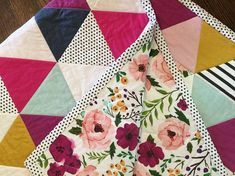 The Boise Modern Quilt Guild will be hosting our annual after Christmas Party on December 27 from 1-3 p.m. at Lori’s house. Saturday’s festivities will include a small potluck to kick off the festivities, door prizes and our apron swap! We are excited to see what kind of aprons everyone has made for their swap partner! If you are participating in the apron swap, please bring your completed apron to the luncheon to exchange. If you signed up for the Moccasin block of the month, please be prepared to provide payment of $19. Once payment is made, you will receive the January pattern to get you started. WiP’s & Wishes Challenge – Bring your completed challenge form & $10! The idea of a challenge to encourage completion of UFO’s (unfinished objects) was presented at our November 2014 meeting. Based on feedback and subsequent discussion amongst the board, this challenge was changed to the “WiP’s and Wishes Challenge”. WiP’s are works in process. 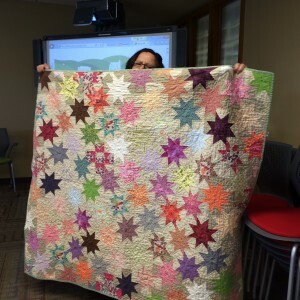 Wishes include a modern quilt related project that you’d like to complete during the year. Each participant will complete the challenge form with 10 or fewer WiP’s or Wishes you want to complete in 2015 and pay the entry fee of $10. Half of the challenge money will go towards the guild; half of the money will be a jackpot prize at the end of the year. Completed projects must be shown at a guild meeting during the “show and share” portion of the meeting. Each completed project earns a ticket towards the jackpot prize. The jackpot prize will be drawn at the last guild meeting of 2015. Use this challenge as a motivator to finish your WiP’s or try something new!! 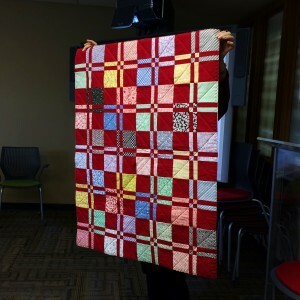 Payment can be made via a check written to the Boise Modern Quilt Guild. Have a hard time remembering to bring your checkbook? We plan to have a debit/credit card swiper available at the After Christmas Party (and going forward) to process transactions via Paypal. Due to Paypal charging the guild a service fee each time the swiper is used, a service fee will be added to your total if you elect to pay via debit/credit card. October’s sew day began with the holidays! 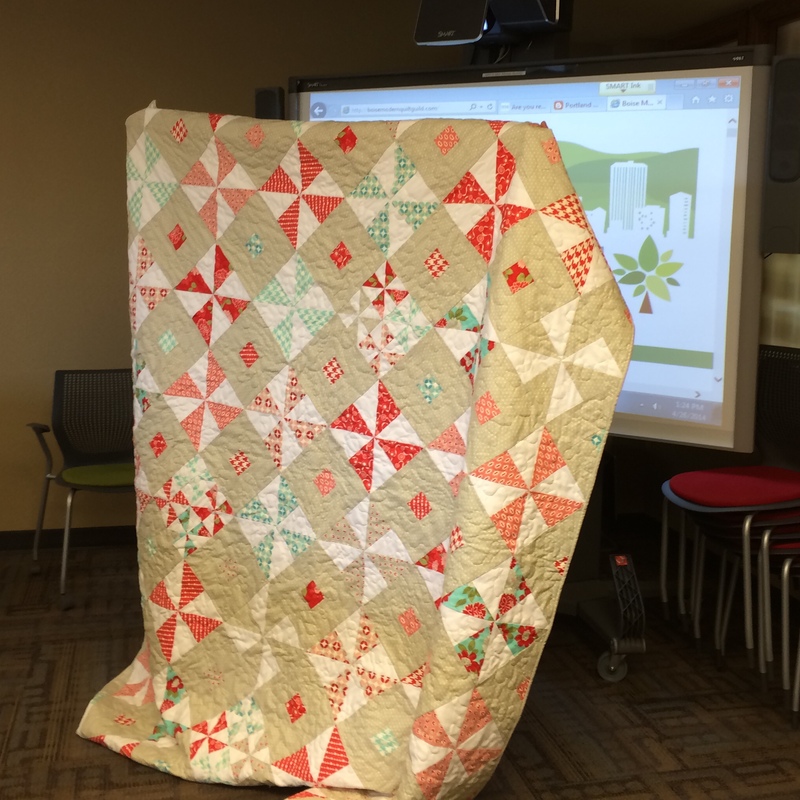 Carolyn Hughey shared two of her unique Christmas quilts with the group. Check out that quilting! We even learned about fabric weaving from our visitor, Nancy. 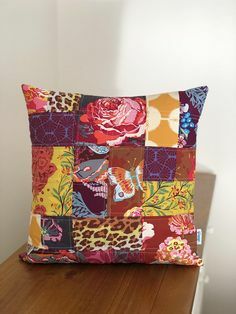 She shared the project she has been working on and it was fascinating to see how two different fabrics can transform into one completely different fabric. We also have a new junior member. Our second! Lori’s daughter Madelyn joined us for her first meeting. We are very excited to have her join our group. Apron swap – At our annual after Christmas party (December 27) we will swap aprons. We will be emailing members a form to fill out so swap partners can learn a bit more about each other’s likes and dislikes. If you didn’t get the email with a link to the form, let us know. Deadline for filling out the form is November 9th. 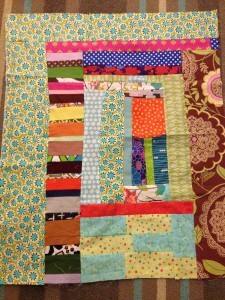 If you have a blog or website related to quilting and or sewing let us know and we can post it on our website. If you have quilting knowledge you would like to share with the group, contact us. We are always looking for guest speakers to lead a tutorial or lecture. 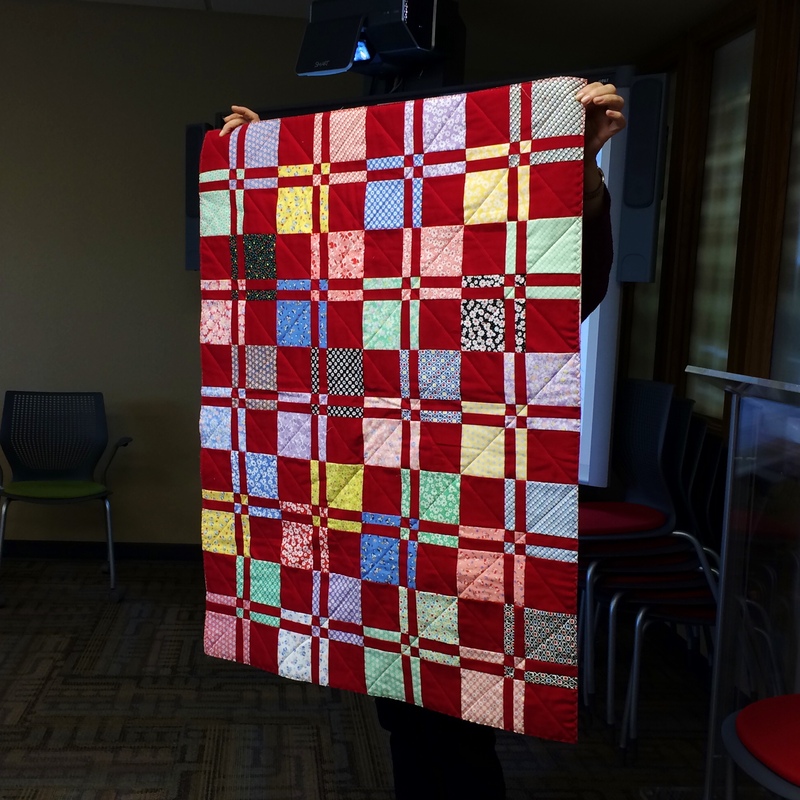 Congratulations to all our members who participated in the Boise Basin Quilt show. The modern quilts were very impressive! Thanks to all that submitted quilts, volunteered at the Boise Modern Quilt Guild table and worked to make our banner quilt. The quilt show was our debut for the banner quilt and it looked awesome! It was the perfect way to advertise the spirit of our guild and everyone’s talents. If you didn’t have a chance to check it out at the show, we will have it at our October Sew Day. Below are some pictures of some of the quilts that were on display. There was a lot of creativity in the room Saturday! Many people bought projects to share and it was fun seeing what everyone was working on. We will have a table at the quilt show at the end of September. We are looking for volunteers to sit at our table and chat with those interested in our guild and modern quilting. Let us know if you are interested. Since the September Boise Modern Quilt Guild meeting is the same day as the quilt show there is no Sew Day in September. Remember to turn in your quilts for the quilt show! You can do so on either September 13 from 11 a.m.-1 p.m. at the Quilt Crossing or September 18 at the Boise Basin Quilters membership meeting from 6:30-8:30 p.m. at Boise Church of Christ, 2000 North Eldorado. If you have quilting knowledge you would like to share with the group, contact us. We are always looking for guest speakers to lead a tutorial or lecture! What a great sew day! This was our second spent working on the banner quilt we are preparing for the quilt show in September. Members not only made blocks on Saturday afternoon, but several brought additional contributions from home. Thanks to everyone’s enthusiasm and hard work we now have 66 blocks! The Michael Miller Challenge fabric was distributed to members that had signed up for the challenge. I think we all agreed it is the best fabric so far. If you were unable to pick up your fabric at the meeting we will have it at the May Sew Day. Remember – the project completion date has been extended to July 25, giving everyone an extra month to create their project. We also shared some our completed projects. It was great to see everyone’s creativity on display. March’s Sew Day was a lot of fun! We had a longer session to sew and talk and share our projects. 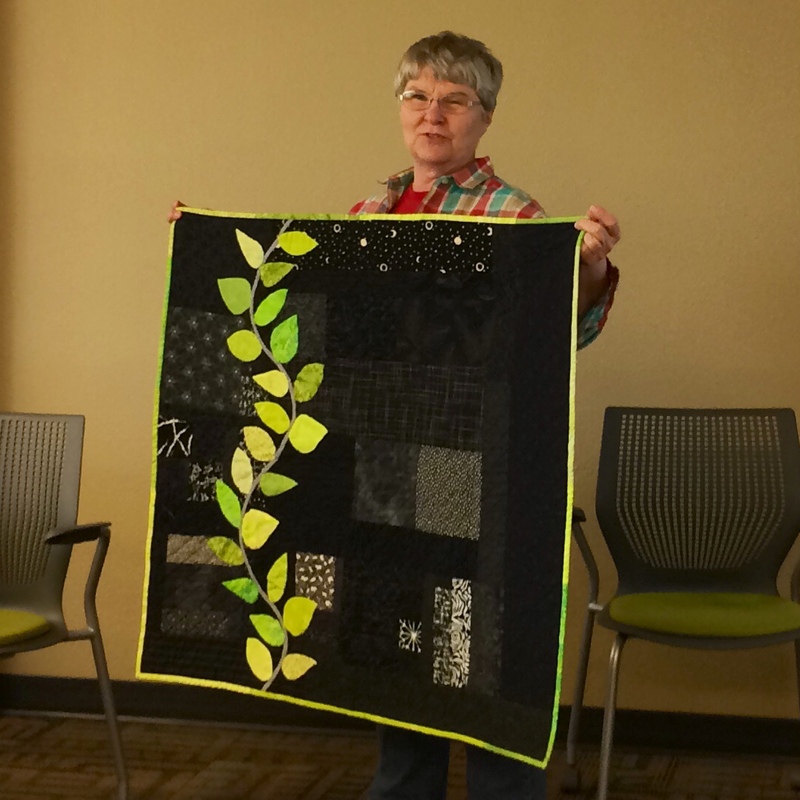 We had a brief update about this summer’s Bogus Basin Quilt Guild Quilt Show that we are invited as guest guild to. We hope to have a lot of submissions from our guild members. Our goal is to enter at least 50 quilts. 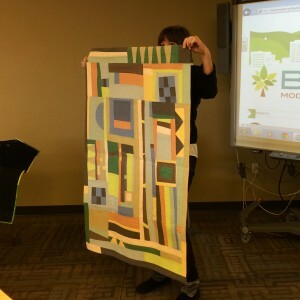 Boise Modern Quilt Guild members are allowed to enter up to two quilts for free, for either judging or exhibit only. (Additional quilts are $3 each.) They have even created a new Modern quilt category this year! You can read more about the particulars on our Quilt Show FAQ page. We had a handful of new faces join us and it was fun to meet and talk with everyone! We also built and gathered 32 blocks for our Guild’s banner quilt. We are half way to our goal of 64! If you have built more blocks to add to our stack, bring them to the April Sew Day. We’ll have a longer Sew Day that day as well, to build more banner blocks. We hope to start building the center part and arrange the quilt sometime in May. I am sorry I don’t remember everyone’s names! But the quilts were fabulous to see and get inspiration from. Thanks, everyone, for bringing your projects to share. She created this for a magazine’s fabric challenge using Downton Abbey fabric lines and won an award for it. Jacket with quilted labels and pockets. Mystery quilt done with BBQG 2013 pattern. Now that we’ve recovered from our Sew Down Portland weekend retreat, we (Christy and Lori) want to share a few pics. Both of us had a great time and look forward to the possibility of attending future MQG events. 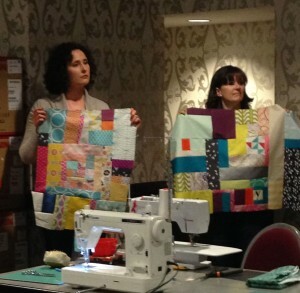 Meeting other modern quilting enthusiasts was definitely a lot of fun and worth seeking out again. Hopefully the MQG will have more future events on the western side of the country to make traveling to and from easy. The pattern for Heather’s You & Me quilt was pretty straightforward and didn’t require a lot of instruction from Heather. As a result, the workshop was mostly heads down sewing time. 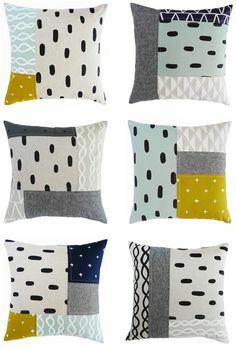 The best part was seeing all the different color and fabric choices for the pattern. Look at all those scraps! Christy’s ready for improv sewing. Bring it on! Finished results of great “conversation” with other sewists during the improv round robin workshop. Christy is on the left holding her finished improv piece in Sherri Lynn Wood’s workshop. Sherri’s workshop was fantastic and a great way to engage in “conversation” with other participants. Each person did an initial starting block that was passed along with our container of scraps to the next person. After taking a look at the general composition, the conversation would be added to from the respective scrap bin. Each sewist who added to the conversation also had her own signature fabric that was added during her turn. Both Christy and Lori really enjoyed the improv workshop and found Sherri Lynn Wood’s approach quite refreshing. Lori’s initial block for the improv round robin. Fun to see how the initial block evolved. Great conversation was had by fellow sewists to complete Lori’s improv round robin block. 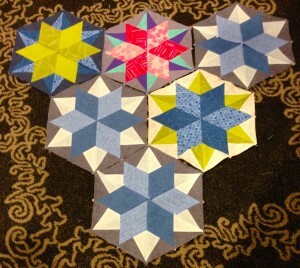 Finished Night Sky quilt pattern blocks from Julie Herman’s workshop. Learning to use Julie’s Sidekick Ruler was a nice change from the typical straight line cuts in quilting. Accurate cutting is definitely a key factor to getting all those points to match! 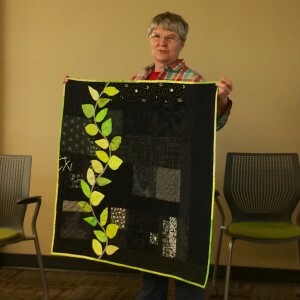 Unfortunately, we don’t have any pics of our last workshop, Shooting Star mini quilt with Lee Heinrich. Lori ended up only being able to stay for the first 30 minutes or so due to catching an earlier flight out of Portland. All in all, we had a great time at the Sew Down. Despite the snow in Portland, we were well taken care of by The Modern Quilt Guild, Drygoods Design, Modern Domestic and The Nines Hotel! Thank you to all!